Through “Project Ghana,” anti-trafficking organization Beauty for Freedom hopes to help at-risk youth define themselves. 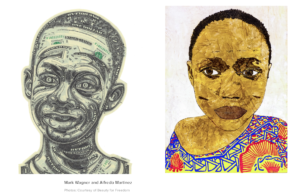 Art has long been considered a tool of human expression—a way to for us to communicate and connect with each other emotionally through visuals. While we often ruminate on how art affects us, the viewers, seldom do we consider what the power of creation means for the artist. Last night, the anti-trafficking nonprofit Beauty for Freedom flipped our perspective and placed the artists—in this case, at-risk youth and survivors of human labor trafficking—front and center. 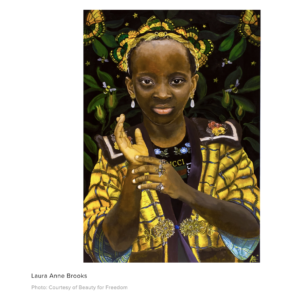 In partnership with the New York Arts Club and worldwide art project Inside Out, Beauty for Freedom bowed “Project Ghana,” an auction and exhibition featuring portraits taken by Ghanian youth and reinterpreted by 13 artists including Erica Simone, Laura Anne Brooks, Zephy, and Ydania Lopez. The goal? To empower children while also raising funds for rescue, recovery, education, and reintegration for survivors of trafficking. Project Ghana Documentary from CTM Sisters Productions on Vimeo. “These youth, through their creativity and through their artwork, are building their own personal narratives,” explained Beauty for Freedom co-founder Monica Watkins. “They’re shaping their own stories, and in that story, being an artist has a place. “Project Ghana” is a collaborative effort with Challenging Heights (a survivor-led anti-trafficking organization in Ghana) and renowned photographer and filmmaker JR, the force behind Inside Out. Last summer, Beauty for Freedom supplied more than 150 pounds of art supplies and SLR camera equipment for a youth-curated exhibition at Challenging Heights’ International Academy. Later this year, Beauty for Freedom will expand “Project Ghana” to include two additional workshops. The organization will also launch a photography book series called Illuminate Ghana, which will continue its mission of empowerment through art.